When it comes to selecting a countertop or tile option for your home or business, you should be on the lookout for a material that will last for many years and that will look beautiful the entire time. And for that purpose, you can never go wrong with granite! Sturdy and stunning, granite will make any room POP with beauty while also remaining reliable for years to come. Whether you want your granite to adorn your bathroom for a touch of beauty that can’t be matched or to top your kitchen counters to give you the most sanitary cooking space possible, you can’t go wrong with quality granite from our experienced tile and marble company! People have to eat — there’s just no getting around that. This means, for those of us who don’t live on a diet of chips and fast food, we have to cook. The aforementioned items are tasty, certainly; but as anyone who has ever dealt with them can affirm, they are often QUITE messy. Sauces and oils leave stubborn stains, and flour can grind into particularly porous surfaces. As for meats: Raw meat, as anyone knows, is a hotbed for harmful bacteria. And should these bacteria work its way into your countertops and other work areas, your kitchen could soon become a hotbed for SICKNESS! With granite countertops, though, you won’t have to deal with this nasty headache. Indeed, with a quality sealer, your granite countertops can prevent bacteria from working their way into your kitchen counters. Fewer bacteria — less likelihood of sickness. Everyone has to eat, but that doesn’t mean that everyone should have to suffer from the bacteria that certain foods can leave behind — not as long as they have a granite countertop! Maintaining a sanitary home is the pinnacle, of course. But “sanitary” is not the only quality you should strive for in your home. Indeed, you should also strive for VALUABLE. There are many things — big and small — that you can do to increase the value of your home. You can get a new paint job, keep the roof in quality shape, get routine maintenance work done on all your major appliances . . .
And, of course, you can have granite countertops installed. Granite is beautiful, yes, and sanitary, yes — and those qualities only make granite that much more valuable! People love a beautiful home, and they love a healthy home. 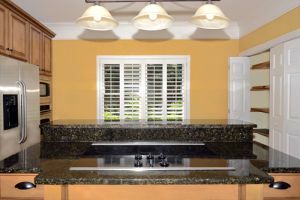 And since granite offers BOTH of those qualities in spades, you can demand the highest price possible for your home when it comes time to sell should your home contain granite in any room. To get the most out of your granite, you need to get only high-quality granite. And to reap the most of its aesthetic benefits, you need to be sure that granite is cut precisely. With Kennedy Tile & Marble Inc., quality and precision are exactly what you’ll get. We at Kennedy Tile & Marble Inc. have been in the business of selling and cutting granite for over thirty years now, so you can depend on us to have all the skills and experience needed to supply you with the best granite possible for your home or business!